The Fairmont Jasper Park Lodge has an outdoor heated swimming pool (see photo above) which is large enough for swimming laps, and is also perfect for relaxing after a day of hiking or skiing. The pool, which is open year round, is surrounded by a deck with lounge chairs and enjoys impressive views of the lake and mountains. Guests at the Best Western Jasper Inn & Suites can take advantage of an indoor pool, Jacuzzi, sauna and steam room. Mount Robson Inn offers two outdoor whirlpools for guests to enjoy. At the Lobstick Lodge there is a heated indoor pool as well as 3 outdoor jacuzzis plus a sauna. The Sawridge Inn offers an indoor heated swimming pool approx 15m long as well as an indoor jacuzzi hot tub plus an outdoor hot tub. At Marmot Lodge there is a heated indoor pool, an outdoor & indoor jacuzzi, plus a sauna. Chateau Jasper offers its guests an indoor heated pool and a whirlpool. 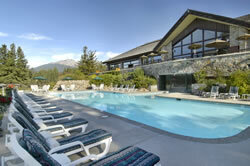 Two rooftop hot tubs can be found at Whistlers Inn, where there is also a steam room for guests’ enjoyment. Tonquin Inn has some impressive pool facilities, with a 72′ indoor heated swimming pool, an indoor whirlpool, 2 outdoor hot tubs plus 3 saunas. Finally, Maligne Lodge offers an indoor pool, indoor whirlpool, an outdoor hot tub, and a sauna. If you don’t stay at a hotel in Jasper with a pool, you can go for a soak or swim at the Jasper Aquatic Centre which is open to the public and boasts a 25m pool, giant waterslide which the kids will love, wading pool, large hot tub and steam room.